All athletes at every level of expertise are at risk for a concussion. That includes pros, weekend warriors, gym rats, and kids. Of course, some sports are more likely to cause head injuries than others. Specifically, football, soccer, lacrosse, and cheerleading put athletes at higher risk. In my profession as an attorney, I see too many people with brain injuries including concussions, among them— bicyclists. Concussions can be serious, but the good news is that much can be done to prevent them as well as manage such injuries when they happen. The saying “an ounce of prevention is worth a pound of cure” never meant more than in the context of concussion and head injury prevention. We have heard it a thousand times before but it bears repeating: WEAR A HELMET. As much as my son hates to hear it, he is not permitted on his bike, his scooter, his skateboard, or any other riding toy without his helmet. Helmets are hopefully a given in the context of school athletics, but learning how to make contact in a safe manner is also a necessity. 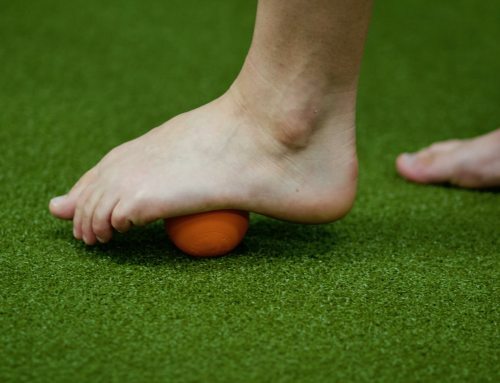 Programs such as Heads Up Football, and coaching proper ball-heading techniques in soccer, all go a long way towards achieving safer play. Such prevention strategies are important because concussions are serious. Make no mistake; a concussion is a brain injury. Despite new research about the long-term effects of concussions, many people still tend to regard concussion almost as a rite of passage for young athletes, a sign that you play hard and aren’t afraid to get hurt. They talk about “getting your bell rung” or “seeing stars.” Almost sounds fun, right? The doctors I work with tell me that they wish we’d dispense with the metaphors and call concussion by its rightful name: mild traumatic brain injury (mTBI). A mTBI can happen anytime there is a blow to the head or an event causing a jarring or shaking of the brain that disturbs brain function. 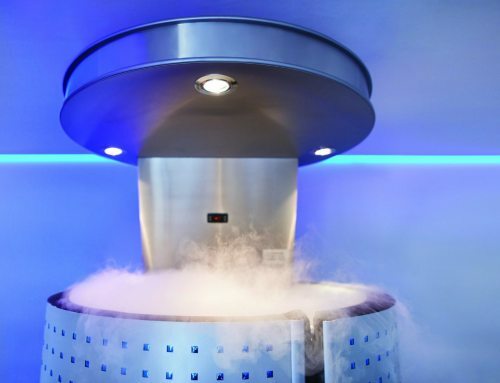 It can do real damage, including “shearing,” when delicate brain cells are actually broken apart. Common signs of a concussion include headache, double vision, dizziness, confusion, nausea/vomiting, or behavioral changes. For concussion diagnosis or assessment, like most things in the world, there is an app for that. 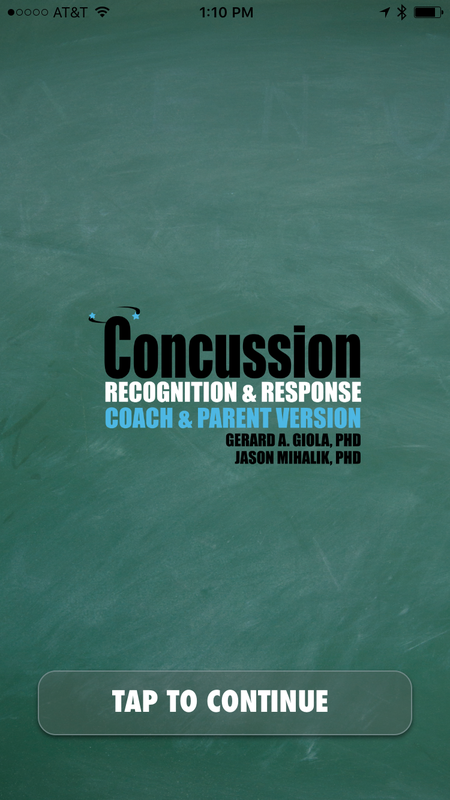 One of my favorites, developed by two experts with ties to the University of North Carolina at Chapel Hill (UNC-CH), Jason Mihalik, Ph.D., and Gerard Gioia, Ph.D, is PAR Concussion Recognition & Response (CRR). 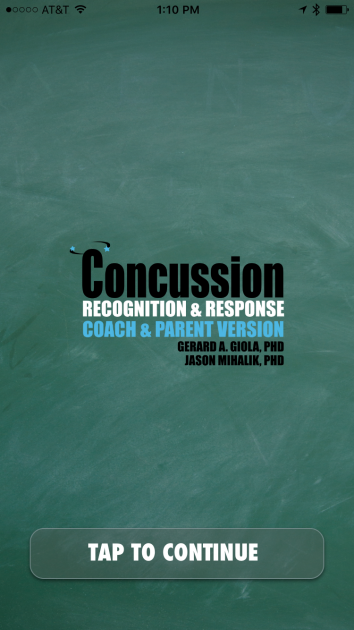 CRR gives real-time advice about recognizing and treating concussion. You start by touching the menu item called New Incident, which walks you through a series of assessment screens, followed by a list of criteria to help you decide whether to treat a head injury as an emergency, questions to ask a child who experienced a head injury, and Frequently Asked Questions. 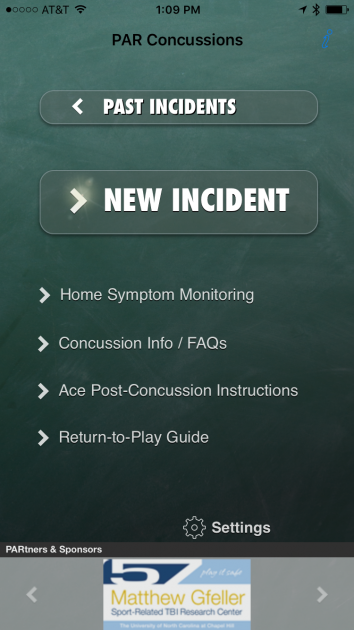 Finally, the app tells you whether a concussion is likely, what led to that assessment, and what you should do about it. Should you need to seek medical attention, the app provides a summary of all the information you input to share with a doctor or EMS worker in person or by email. 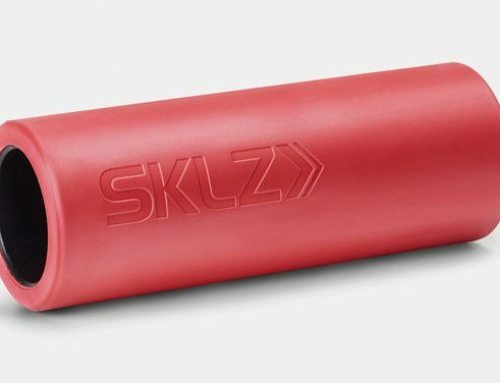 I have this app on my phone in the event that there’s a cycling accident, or for any situation such as school athletic events, accidents on playgrounds, or anywhere else a blow to the head can occur. I’m thankful that I have not actually needed to use it, but I’m glad to have it close by. NOTE: When in doubt, call 9-1-1. An app should never replace caution and common sense. When a concussion is suspected, seek medical attention immediately, as sometimes what appears to be an insignificant blow to the head actually causes bleeding on the brain, a potentially fatal condition only discovered through a brain scan. While this happens in an extremely small number of cases, better safe than sorry. Thankfully, studies show in the majority of cases, concussion symptoms generally resolve over time. Even so, proper concussion management is a necessity. Concussion specialists generally recommend brain rest, giving the brain time to recover like you would any other injured body part. An effective concussion recovery protocol includes taking time off from work or school, reducing time on electronic devices or from television, and returning to cognitive activities slowly. Although a single concussion can cause significant damage, an even more worrisome scenario occurs if a second hit happens before the brain has healed; the harm can be exponentially worse. Athletes who go back to their sport too soon after a concussion are at risk for second impact syndrome, which can cause rapid brain swelling and death. Such scenarios in the context of school athletics resulted in the passage of the Gfeller-Waller Concussion Awareness Act in North Carolina in June 2011. The law addresses three primary areas of concern: (1) education and prevention, (2) emergency action and the implementation of proper and effective post-concussion protocols, and (3) appropriate rules for when an athlete may be cleared to return to play or practice. To ensure compliance, schools must perform functions which include but are not limited to: (1) distributing concussion educational materials to student-athletes, parents, coaches and other volunteers, (2) developing an emergency action plan for a concussion event which must be approved by a Licensed Athletic Trainer and outlines roles, availability of emergency medical equipment and emergency transport, and (3) restricting return-to-practice/play until a medical professional provides written clearance for the student-athlete to do so. Our athletic hobbies and endeavors are part of what make life so special. To enjoy them as safely as possible, take the time to engage in concussion prevention strategies for yourself, arm your children and others with the knowledge and habits necessary to reduce the likelihood of harm, and be smart when it comes to recovery from any injury, concussions included. Be safe, and I’ll see you on the road!